When you are planning a flooring renovation for your home, it can be good to know you have many options available. For a stylish flooring choice that suits nearly any application, take advantage of the transformative abilities of ceramic tile. From contemporary to Old World themes, the versatile nature of tile flooring makes it widely adaptable and lends itself to use in a vast array of settings. From dining to living rooms, no matter what finish you prefer, tile flooring has something to offer you. For a look that will dazzle family and guests, look to our flooring specialists for a wide selection of high-quality ceramic floor tiles. The durable quality and innovative style of ceramic tile flooring instantly transforms the look and feel of any room you apply them in. Rejuvenate your floors with this timeless option and bring an air of excellence to your interior design. As homes age, homeowners begin to look for areas that need updating for the sake of maintaining visual appeal and to ensure that they can protect their investment. The most effective way to restore the value and appeal any room is to install new flooring. As the foundation of any room, flooring is often one of the first places that guests and visitors notice. If you are tired of worn-out floors in your bathroom, kitchen, or any other area, enhance the aesthetic of your living space with the enviable appeal of ceramic tile flooring. Mix and match a variety of styles and patterns to create a unique look that is all your own. The versatility of this flooring lends itself to a wide spectrum of design choices. Whether you are looking for Mediterranean flooring for your kitchen or a retro layout for your living room, ceramic tile adds appeal or character to your home. 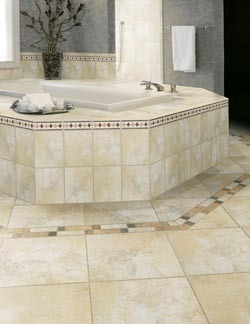 Ceramic floor tiles can also be mounted on walls and countertops depending on your design plan and budget. At our expansive showroom, we carry an impressive selection of ceramic tile flooring choices in a wide variety of textures, patterns, finishes, and styles. Under the guidance of our knowledgeable professionals you can find the perfect selection for your unique remodeling project. Share your aesthetic or functional needs with us and we provide you with fine flooring options that immediately improve the look and feel of any room you choose. Let’s face it. We like it when things are easy. If you are a homeowner leading an active lifestyle, or you have little ones always on the move, you probably don’t want be troubled by lengthy housekeeping or maintenance, especially not with your flooring. Though no flooring can go without maintenance, ceramic floor tiles are about as close as it gets. Installing ceramic tile makes for quick and easy maintenance. You don’t have to break out the harsh chemicals and latex gloves every weekend to maintain their appearance. To clean your these floors, you need only to mop with warm water and follow by a bit of simple sweeping to keep your floors looking like new. This simple maintenance routine helps protect your children and pets from toxic cleaning agents and reduces the amount time you have to devote to cleaning your floors. With minimal maintenance your family and guests will enjoy your new beautiful ceramic tile for years to come. Ceramic tile is composed of natural clay-based products, minerals, and water. It can come finished or unfinished. Finished tiles are kiln-fire coated with a stain resistant glaze. This protective glaze allows the finished product to retain a high resistance to staining and impact. This resiliency to staining and wear makes this type of flooring an ideal decorative element for rooms that experience a substantial amount of foot traffic. These tiles don’t burn or singe, making them great for kitchen applications where a heated cooking instrument or utensil might be dropped. When combined with a grout line, they are highly impervious to water, making them great for bathroom applications as well. In addition, ceramic doesn’t harbor germs easily. This makes it an ideal choice from homeowners sensitive to common allergens and those with asthma because tile’s surface is inhospitable to dust mites, mold, and bacteria. Installing ceramic tiles can significantly improve your indoor air quality. Tile is fired in a kiln at an extremely high temperature. This ensures that there are literally no dangerous compounds in the finished product. As a result, when you retrofit your home with ceramic tile, you can take pride in having a safe, stylish, and practical home flooring. Turn to our professionals for flooring that offers continuous performance long after you have finished your project. Ceramic floor tiles withstand the wear and tear that comes with having a family and you won’t spend your days worrying about fading or discolorations. When you put your restoration needs in the hands of our capable experts, you can enjoy a look that stands the test of time. Combining ease of care, innovative appeal, and modern styles, ceramic tile offers something for every taste and preference. Style counts and tile is no exception. From Southern to Cosmopolitan, ceramic floor tiles can fit nearly any desired aesthetic. Outfitting your home with a tile floor made of ceramic is an effective way to make a statement about your family and the place you live. When you visit our full-service flooring store, our interior design specialists work to help you achieve the look and feel you wish to set for your home. From purchase to installation, we work tirelessly until the flooring you want rests comfortably beneath your feet. 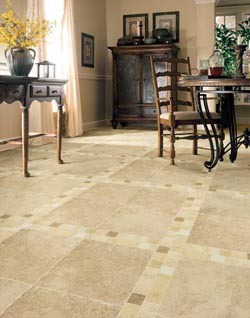 Contact us today for a free estimate on the finest ceramic tile and other flooring for your home. We proudly serve customers in Fairfax, Fairfax Station, Falls Church, Centreville, and Gainesville, VA, and the surrounding areas.